FIGURE4 ■ Endopelvic fascia dissection. After the endopelvic fascia is incised (arrow indicating edge of fascia), a space is developed lateral to the prostate until the prostatovesical junction and corresponding fat pad is identified (double arrow). Distally, the puboprostatic ligaments and superficial dorsal vein (arrowhead) are seen. After the dorsal vein suture is placed, a traction suture is placed on the prostate (double arrowhead). FIGURE 5 ■ Division of bladder neck. 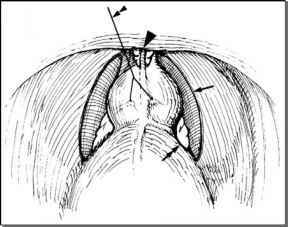 After dividing the bladder neck (arrow), the dissection is carried inferiorly, posterior to the prostate, until the vasa and seminal vesicles are identified. FIGURE 7 ■ Lateral pedicle dissection. Contralateral traction is provided by an assistant. The pedicle may be divided with clips and scissors as shown. The plane of dissection varies depending on whether a standard nerve-sparing procedure or "veil" is performed. 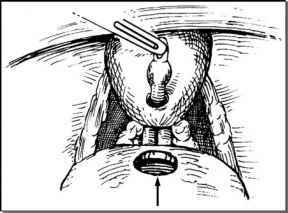 FIGURE 6 ■ Development of the plane posterior to the prostate toward the apex. The left-side assistant provides upward traction on the divided vasa and seminal vesicles (arrow). A meticulous apical dissection is crucial to excellent cancer control and maintenance of continence. surrounding tissue. Hem-O-Lok® MLK clipse may be used for hemostasis. The majority of the dissection is performed sharply and bipolar is used for discrete bleeding. For a standard nerve-sparing dissection, a plane is developed posterior and parallel to the prostate. 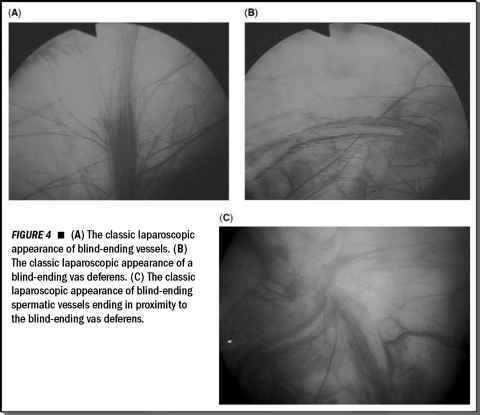 At our institution, an additional accessory nerve preservation procedure is performed in which the main neurovascular bundle as well as perforating micropedicles are preserved. Patients who have excellent preoperative sexual function and minimal volume of Gleason less than seven disease are offered this procedure. A plane of dissection is developed posterolaterally between the layers of periprostatic fascia and is continued distally toward the puboprostatic ligament. A veil of tissue remains, the "veil of Aphrodite," and encompasses the main neurovascular bundles and the perforating branches within the periprostatic fascia and is continuous with the puboprostatic ligament distally (Fig. 8) (12). Furthermore, in a given patient, a standard nerve sparing may be performed on one side and a veil performed on the other.